AFC Wimbledon manager Neal Ardley says his side must play without fear in order to move clear of the League Two relegation zone. The Dons are currently bottom of the table, two points from safety. He told BBC London 94.9: "These boys have got to play without fear and go and express themselves. "Everyone has got to rally round each other to push forward. Win, lose or draw we've got to stick with it. It will not happen overnight." He added: "Yes, we need to know about the opposition and work hard on game-plans. "But when they actually get the ball we have got to let them play the football they can play. "The more you go along without picking those points up the harder it gets. We have got a hell of a lot to do but we need to have belief. "We have got to be mentally strong. "We will leave no stone, no training session, no minute unturned in trying to get where we need to be. "We have got a third of the season to go and we've got to use it to get the six or seven wins we need." 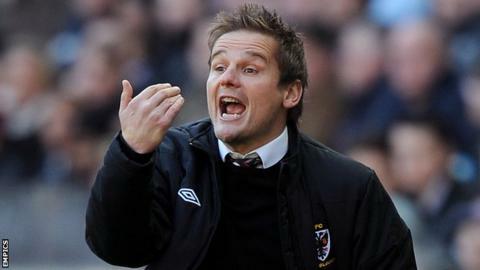 Ardley, who made over 300 appearances for Wimbledon FC, says it has taken time to implement his ideas since taking charge at Kingsmeadow in October. "I'd like to think since I've come in we've been a very hard-working team," he said. "We've lacked quality at times but that probably comes from a lack of belief. That happens when you are down there and winning is not a habit. "It's my job to try and instil that over this final third and get that back to where it needs to be. "We have got to retain our League status and that's what everyone down there is fighting for. "I will be judged on that. "I am trying to make small changes and add little bits. That is taking time but ultimately I have to get that right." And Ardley says that back-to-back defeats against Port Vale and Chesterfield has made him alter his own outlook and approach in order to help the team. "We are all emotional after a game and I think it is a good sign," he said. "A few things were said in the dressing room after the game [against Chesterfield] amongst players and between ourselves. "You go home and you reflect. I drove home to see my family in Cardiff. "It was a long drive and then you start looking at yourself. "It has got to be positive from now until the end of the season." Despite the club fighting to retain their Football League status, having never been relegated since their formation in 2002, Ardley says he must learn to cope with the situation, in what is his first managerial post. "It is a pressurised situation we are in now," he said. "With everything this club has done to get itself here over 10 years, you can put the fear and the weight of all of that on your shoulders. "You can feel that pressure but I don't think any of that can be more pressure than I put on myself. "Through fear of failure, or fear of not doing what I believe I was destined to be and what I believe I will be very good at, that's where I looked at myself. "We are in the situation where you need a calm head and need to lead. "You need to set an example and if I don't think I am in some aspects, you've got to change and that's what I have tried to do this week."